If you are living in a country like India where Food is not eaten for energy but to celebrate and thanks for the gifts of Mother Nature then you definitely know about Nariyal or Coconut. It is easily available in coastal areas and very common to be used in Hindu culture and different ceremonies. The fruit is equally tasty and healthy for your health as it is a gift from Nature. You can Enjoy Nariyal Burfi, Nariyal Paani, Fresh Cream of Nariyal, Coconut oil and the Husk can be used in the preparation of many traditional medicines. All in one this fruit is strong both from the outside and the health benefits are equally stronger from the inside. More over dried coconut or copra has even more benefits for health. 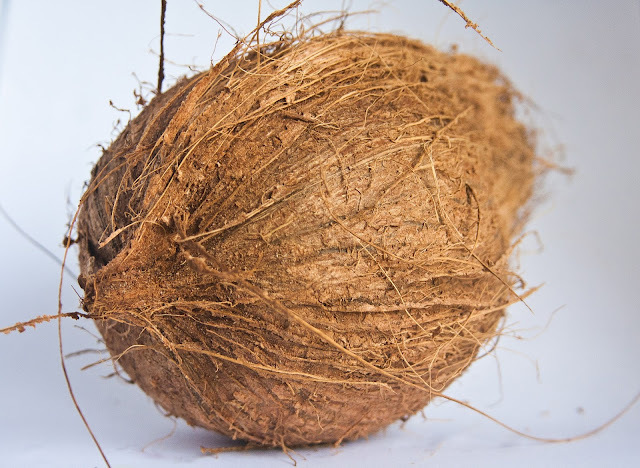 In English it is known as Dried Coconut, in hindi, marathi and gujrati it is commonly known as Copra, in Tamil it is known as Ular tenkay, in Telugu they call it Endu Kobari and in kannada they call it Vona kobari. We would like to share that dried coconut contains high nutritional value. However, if you are planning to lose some serious weight then you need to consider carefully the fact that While Dried Coconut contains healthy fats; they still can cause some fat issues. So, you’ll need to count your calories when adding coconut dishes into your daily meal plan. Coconuts are the best source of dietary fiber and provide almost 61% of fiber. Coconut fiber is healthy for your body as they slow down the release of glucose effectively and transports the glucose to the cells where it is then converted into energy. This process assists in relieving stress on the enzyme systems and pancreas. Dry coconut is very useful during pregnancy as it helps in improving the immunity of the mother and baby. This helps them to prevent any infection and other diseases related to birth. The levels of amniotic fluid also get boosted which is good for the overall health of the fetus. Monolaurin and lauric acid are present in Coconuts in an ample amount which helps to kill viruses, bacteria, and fungi. Coconut will definitely help you to reduce bad breath, kill mouth bacteria and to improve your overall dental health. Those people who are lactose intolerant eating coconuts regularly is a healthy alternative. This not only supports the proper development of bones and teeth but improves the ability of the body to absorb manganese and calcium which aids bone development. Thus consumption of Dry coconut also prevents osteoporosis, a condition in which the bones becomes thin and fragile and also loses their density. Coconut are good for Diabetics too as it helps in improving the insulin secretion and the blood glucose utilization. By positively affecting the hormones responsible for blood sugar it controls control diabetes. This helps to reduce glycemic cravings and slows down the rise in blood sugar level effectively. Other benefits of desiccated Coconut are quick digestion and treatment of other symptoms which deals with digestive and bowel disorders. Consumption of coconuts supports absorption of essential minerals and nutrients while providing dietary fiber. Dry coconuts are definitely healthy for your skin and body organs. trans-zeatin, kinetin, and Cytokinins present in desiccated coconut have anti-ageing, antithrombotic and anti-carcinogenic effects on your body. Dry Coconut nutrition in your food is excellent for your body’s immunity system. It is antibacterial, antiparasitic, antiviral and antifungal. Intake of coconut oil can definitely help your body to mount a resistance against urinary tract infection, tapeworms, throat infections, bronchitis, and various other ailments which are caused by microbes. In the treatment of dangerous fats especially in the abdominal cavity, the Coconut is highly beneficial. In the prevention and cure of the world’s deadliest disease, Coconut nutrition can definitely help you. It has been already proven successful, that this fruit has anti-cancer properties. Especially in the treatment of colon and breast cancer this fruit is highly beneficial. The coconut contains a natural diuretic property for the treatment of urinary tract infections. It amazingly improves the flow of urine to prevent any type of infection naturally. Desiccated Coconut is useful to improve the blood cholesterol levels of your body and it also minimizes the risk of heart diseases. The coconut contains saturated fats which raise the good cholesterol and regulates LDL to a benign subtype. This type of improvement in your cardiovascular risk factors leads to reducing the risk of heart diseases. What are connective tissues? our skin, bones, ligaments and tendons all of them come under the category of connective tissues. These tissues have a lot of minerals, and any deficiency of these elements affects the body. Desiccated coconut is loaded with minerals, which the body can easily absorb and process. Including dried cocnut in your diet prevents the deficiency of these minerals and reduces the risk of many serious diseases, such as arthritis and osteoporosis. 15) It promotes your brain function. Dried coconut is known to improve and promote a healthy brain function. Dried coconuts contain chemicals that promote the production of neurotransmitters as well as myelin. Myelin is the fatty coating over the neurons which allows them to transmit electrical signals to the brain more efficiently. Any damage to the myelin cover of your neurons leads to severe neurological problems. Coconut works amazingly in protecting the myelin cover and promotes your brain health. As per recent research, coconut oil is found to be efficient in the treatment for Alzheimer’s. It helps in slowing down the progression of the disease as well as prevents it. 1. Break the coconut with a hammer. 2. Open it up. Peel the white flesh out. 3. Using a cheese grater, grate the flesh. 4. Dehydrate the grated flesh for about 8 to 10 hours at 135 degrees F.
1. First, preheat the oven to 177 degrees C.
2. Then Drill the coconut through the eyes. You can use a mechanized tool too. And then extract the coconut water in a dish or cup. 3. Then place the empty coconut directly in the preheated oven. Heat it for 20 minutes. 4. Now remove the coconut from the oven and carefully wrap it up with a towel. Hit the coconut with a hammer gently and constantly, till it breaks. 6. Reduce the oven temperature to 121 degrees C.
7. In a food processor, Shred the coconut flesh into pieces and spread them on a tray. Dry this plate having coconut pieces in the oven for 10-15 minutes. 8. Let cool. Use it all according to your need.